Inflammed growth plate in Iselin’s disease in a child. Iselin’s Disease is pain around the base of the little toe (5th metatarsal). The pain may radiate down the lateral (outside) of the foot. It is commonly described as a sharp/aching or ‘bruised’ type of pain. This is often associated with localised swelling and redness. Pain typically gets worse with activity occasionally resulting in a ‘limp’. Common in children between 8-16 years old especially those that are physically active. Adults cannot get Iselin’s disease as the growth plate closes over and turns into bone with skeletal maturity at approximately 16 years old. Adults can get pain in the same place as this is the point of attachment of a muscle. What causes Iselin’s Disease ? 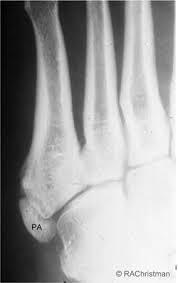 In children up to the age of about 16 years, the bones in the feet still have growth plates present. These growth plates are made up of soft cartilage. Eventually this hardens and fuses once growth/development has slowed or been completed. 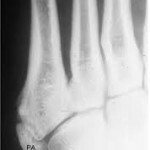 There is an epiphysis (growth plate) that is situated on the base of the 5th metatarsal. This is half way down the outside edge of the foot. Around this area is also an important attachment area for the peroneal tendons. These tendons runs all the way from just below the lateral knee down the lateral (outside) of the shin. They run down and attach into the bones in the area we are discussing. Over-loading of this tendon with regular sports/activities causes the tendon to become acutely inflamed and irritated. At the same time in a growing child there are typically phases of rapid bone growth. The surrounding muscles and tendons then have to play ‘catch up’ to this growth. At times, they may be shorter and tighter than normal. The combination of acute inflammation from repetitive stress, with a short and tight peroneal tendons due to rapid growth, results in excess tension and inflammation on the growth plate (epiphysis). The end result is pain, swelling and occasionally bone or cartilage over growth around the base of the little toe (5th metatarsal). How do you treat Iselin’s Disease? Iselin’s disease should initially be treated by the RICE (Rest Ice Compression Elevation) method. A reduction in sports/activities is necessary to reduce repetitive stress on the growth plate. Time is needed to allow repair of the growth plate to take place. A Podiatrist can also play a vital role in the rehabilitation process of Iselin’s disease. Over-activity or repetitive stress of the peroneal tendon may be caused by biomechanical abnormalities within the leg or foot. This can cause the peroneal tendons to work harder than normal to stabilise the foot. A Podiatrist can assess the lower limb mechanics and discuss the use of orthotics to manage this.